Friday, January 18: Five-and-a-half days ago, Winter Storm Gia did her best to wreak havoc on us travelers and, from my spot halfway up the inclined snow-covered driveway, she did an excellent job. Had it not been for a pair of neighborhood teens who happened to be outside when I arrived home shortly after 10 p.m. last Saturday, I would have had to set the parking brake and dig myself out. Because they were there, me and my car were fully home 10 minutes later. The snow from that system remained on the ground thanks to this past week’s chilly temperatures and, as I prepared for my latest Travelin’ Man adventure, Old Man Winter was poised to strike not once but twice in the next few days. Thankfully, at least for the next couple of days, I will be far away from my area’s meteorological ravages. That’s because I will be trekking to Las Vegas – and to the biggest fight of the young boxing year so far. Manny Pacquiao vs. Adrien Broner was a match few saw coming yet once it was made, it made all the sense in the world. After all, this pairing has many of the usual traits of a saleable fight – high name recognition on both sides, brightly defined contrasts in terms of ring styles and personalities and the very real possibility that a loss, especially by knockout, will lift one man’s future prospects measurably while possibly bringing down the curtain on the other man’s career, at least in terms of securing big-money paydays in the near future. At 40, even Pacquiao knows he’s near the end of an incredibly long (24 years) and decorated career (eight divisional titles when one includes his two Ring Magazine belts). Conversely one couldn’t have expected a few years back that Broner, now just 29, would end up being placed in a similar “win or else” situation. Broner’s nickname of “The Problem” was originally intended to be a pairing mechanism with his twin brother Andre, whose nickname was “The Solution.” Now, it is emblematic of his life outside the ring (which is stuffed with run-ins with the law and other spectacles too numerous to completely chronicle here) and inside the ring, which has produced plenty of trash talk and other antics that have ignited white-hot hatred from numerous quarters. Broner’s latest incident occurred at the final press conference when Broner refused to answer questions posed by emcee Al Bernstein because the fighter objected to Bernstein’s remarks about him on Twitter. Bernstein, for his part, handled the situation with his typical good humor and class, then moved on with the unexpectedly shortened proceedings. Broner once aspired to become “Floyd Mayweather 2.0,” a fighter with “Money’s” pristine record, his luxurious trappings and his worldwide fame but who wanted to add his own twist to the model. He certainly was on his way, for coming into his December 2013 fight with Marcos Maidana, Broner built a 27-0 record (one no-contest) with 22 knockouts and was fresh off a split decision over Paul Malignaggi that netted him his third divisional title. Broner’s talent was as self-evident as his persona as he wiped out fighters at 130 and 135 and achieved the direct jump from lightweight titlist to welterweight titlist that only Henry Armstrong, Roberto Duran and Shane Mosley had pulled off (and that WBC lightweight beltholder Mikey Garcia hopes to complete against IBF welterweight titlist Errol Spence Jr., for while he did win a 140-pound belt in between, he vacated that belt and subsequently united two lightweight titles against Robert Easter Jr. in his most recent bout). Broner’s skill set famously prompted one member of The Ring Magazine’s ratings panel to infamously (and prematurely) rate Broner third in his pound-for-pound rankings. Despite his obvious talent, Broner’s off-the-charts swagger caused many fans to fervently wish for his comeuppance but, like Mayweather, Broner had the ultimate answer – the zero in his loss column. 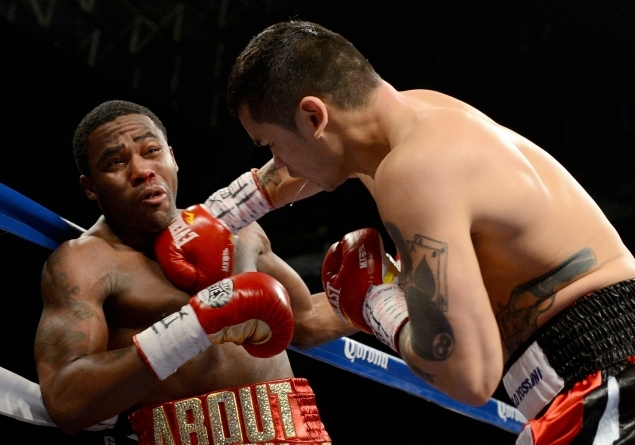 Marcos Maidana (right) vs. Adrien Broner. Twelve rounds later, that zero was gone and the sight of a badly beaten Broner being helped to the dressing room while being drenched with beverages provoked spiteful cheers from some of his most hardened critics. Since then, Broner, four months after losing to Shawn Porter, won a fourth divisional title at 140 and has gone 2-1-1 since, with the loss (L UD 12 to Mikey Garcia) and the draw (D 12 Jessie Vargas) coming in his last two outings. Instead of becoming his generation’s Floyd Mayweather Jr., Broner is in danger of becoming his generation’s Ricardo Mayorga, an accomplished fighter later pegged to be the headline-generating villain other stars end up beating. A big difference is that while Mayorga was knocked out by Felix Trinidad, Oscar De La Hoya, Shane Mosley (twice) and Miguel Cotto in a 10-fight span, Broner is defeated over the distance. However Broner shares with Mayorga a gift for creating headlines with his unfiltered verbiage and if he is to stave off the comparison with the curiously nicknamed “El Matador,” “The Problem” needs to beat Pacquiao as well as the 3-to-1 odds against him. Pacquiao had his own well-documented wild-child days and, like Broner, his record has been pockmarked with losses. After an extraordinarily productive 15-fight winning streak that earned him titles in five weight classes and established him as a global superstar as well as a Filipino icon, Pacquiao suffered back-to-back losses to Timothy Bradley and Juan Manuel Marquez, a desultory decision to Mayweather in this generation’s most heavily-hyped fight and a points defeat to Jeff Horn that eroded his record to 5-4 in a nine-fight stretch. Pacquiao’s supporters would say the following: (1) Pacquiao twice avenged a Bradley loss most thought he should have won, (2) Pacquiao was winning the fourth Marquez fight (47-46 on all cards) before the Mexican knocked him unconscious with a single punch that some suspect was enhanced by artificial means and (3) the Horn loss two fights ago was also roundly criticized as unjust. Many were somewhat surprised by how good he looked in his most recent outing last July against Lucas Matthysse, whose prodigious power had injected an element of doubt coming into the bout. 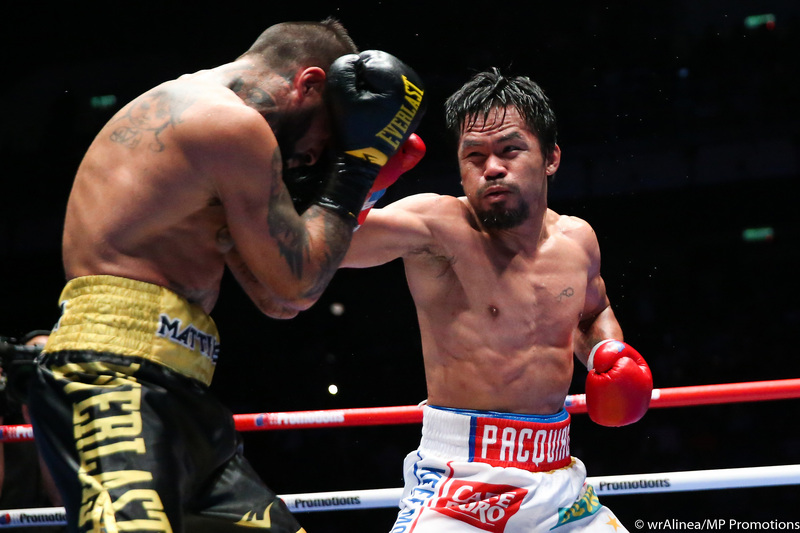 Instead Pacquiao packed the bigger punch as he scored knockdowns in rounds three and five before adding the final one in round seven. It was Pacquiao’s first knockout victory since his stoppage of Cotto in November 2009, perceived by most to be the absolute peak of his career and which would have been the perfect lead-in to a Mayweather match. Pacquiao’s soft-spoken but charming persona, which, in recent years, has been accompanied by a revival of spiritual devotion, has earned him a largely positive image (though his anti-gay remarks in early 2016 ignited a firestorm of criticism). His philanthropic efforts jump-started a successful political career that could eventually vault him to the presidency in the Philippines. He fights because he can and because he says the desire to fight (and train) is still there. His reunion with longtime trainer Freddie Roach added another “feel-good” element to his end of the Pacquiao-Broner narrative and this bout marks the first time in more than two years that he has fought on U.S. soil. Yes, Pacquiao has had activity – and dozens of people – swarming around his orbit for years but, unlike Broner, “The Pac-Man” has found a way to manage his busy life and produce positive results inside the ring and out. Broner, who bears no animus toward Pacquiao, might do well to consider seeking his opponent’s advice on how to better manage the stresses of fame. In terms of breaking down the fight statistically, it is surprising to note that for all the criticism regarding Broner’s anemic work rate, Pacquiao has averaged fewer punches per round in his last five fights (39.9 to 43.1 for Broner). Pacquiao’s slide is even more dramatic when one considers he averaged a robust 65.5 punches per round in his preceding 12 bouts. Also Broner, at least at 130 and 135, possessed an extraordinary powerful second gear in the second half of fights. Despite having less throttle at 140 and 147, Broner still throws more punches in the second half of his last five fights (47) than in the first (39). That was evident in his most recent fight against Vargas. Broner lost most of the first six rounds because he averaged 38.8 punches per round to Vargas’ 77.1 and was out-landed 124-82 overall, 39-29 jabs and 85-53 power in that span. But once Broner settled into the fight and greased up his gears, he found his way into the fight. OK, his next gear wasn’t great in terms of output – he upped his work rate to just 45.8 punches per round – but Vargas’ deceleration to 63.3 punches per round and his lesser accuracy resulted in Broner leading 112-79 overall and 99-56 power. In the 12th, Broner led 14-8 overall and 13-4 power, margins that normally would have won him the round. However because judges Eric Marlinski and Kevin Morgan scored the fight for Vargas (contradicting Julie Lederman vote for Broner), the fight was a majority draw instead of a majority decision win for Broner. The final numbers were close – Vargas led 203-194 overall and 62-42 jabs while Broner prevailed 152-141 power – but Broner was more accurate in all phases (38%-24% overall, 26%-19% jabs, 44%-27% power). The CompuBox round-by-round breakdown – useful because clean punching is one of the four aspects judges use to score rounds – tracked exactly with conventional wisdom: Vargas landed more total punches in five of the first six rounds while Broner did so in five of the final six. Broner, like his inspiration Mayweather, has long been a marksman with his power punches: In his last five fights, he landed at an impressive 46.6% clip. If he can do the same against Pacquiao, it would be worthy of praise because, in his last five bouts, Pacquiao has allowed only 27.8% of his opponents’ hooks, crosses and uppercuts to get through. The gap on the other side of the ledger is less dramatic; Pacquiao has landed 37.7% of his power shots in his last five outings while Broner’s last five opponents have connected on 32.4% of theirs. So how do I see this fight playing out? Despite Broner’s diminished record as of late, the 29-year-old is still a threat. He’s naturally bigger and his punches carry plenty of steam. It’s one thing for Pacquiao to look great against a 35-year-old Argentine not known for his competitive resolve under fire but a similar win over Broner (who will surely pack on weight after the weigh-in) will be even more so. Pacquiao has done it before (a 144 ½ pound Pacquiao pounded an Antonio Margarito who scaled 165 inside the ring) but that fight took place a little more than eight years ago and Pacquiao is no longer the whirlwind that overwhelmed foes with lightning hand speed and breathtaking footwork (for those too young to have seen the prime Pacquiao, think of Vasiliy Lomacnenko today). The fusion of Broner’s size and underutilized talent and Pacquiao’s chronological state makes this an interesting fight to call. The guess here is that Pacquiao, who overcame his own out-of-the-ring demons through renewed faith, will find enough of his prime years to out-hustle Broner in the early rounds and to survive the Ohioan’s modest late-round surge to win an entertaining and competitive decision. Because I needed to be in Las Vegas in time for the 4 p.m. day-before electronic checks and the 5:30 p.m. format meeting, I needed to do what shift workers do on a regular basis – completely reverse my circadian rhythm. Normally I am both an early bird and a night owl because I arise around 8 a.m. and go to bed between 2 and 3 a.m. But because of my need to be in Vegas during the mid-afternoon hours – and because I live two-and-a-half hours away from the closest international airport – I had to request especially early flights. When I did this a few weeks earlier, I was chagrined to discover there were no direct flights on Fridays from Pittsburgh to Las Vegas on either American or Southwest (the two carriers for which I have the most frequent flier miles). So I went for the next-best-thing: A two-flight itinerary that would remove me entirely from the snow belt and would get me to Vegas well within the time strictures placed on me. My best option was an 8:25 a.m. flight from Pittsburgh to Phoenix, then, following a two-hour layover, a 2:05 p.m. MST flight from Phoenix that would land in Las Vegas at 2:10 p.m. PST. If all went well, I would be inside the MGM Grand (the crew hotel) by 3 p.m., which would give me an hour to check in and settle in. To make this itinerary work, however, I needed to arise by 2 a.m. in order to leave the house by 3 and arrive in Pittsburgh by 5:30 a.m.
Southwest, unlike other airlines, does not have assigned seating. Instead passengers are divided into three groups of 60 and are defined as “Group A,” “Group B” and “Group C.” Upon boarding the aircraft, passengers are allowed to sit wherever they wish but the options shrink with every succeeding place in line. Based on my experience, Group A passengers are guaranteed to snag their desired window or aisle seat, while many in Group B should feel OK about their remaining options. Group C passengers, on the other hand, will likely end up in an undesirable location, such as the very back of the plane, near a bathroom or in the dreaded middle seat. Additionally overhead space recedes to the point where Group C passengers will have to check their luggage and I learned early on that avoiding baggage claim is always the best policy. Because I drew “C-41,” I would theoretically be the 161st person to board after military personnel, wheelchair-bound passengers and other early boarders. Seen another way, because there were 175 people on this flight, I was 14th from last in line. It’s bad enough to be in a middle seat but to be in a middle seat on a long flight is about as bad as it gets because of the cramped conditions. However Southwest does offer an “out” for passengers like me; it’s called “Business Select.” For a fee – between $30 and $50 depending on the route – I could guarantee myself a place between A-1 and A-15. I could have opted to buy it during check-in but I chose not to do so because I wanted to pay for the upgrade myself and not put it on Showtime’s tab. So the second reason I wanted to leave the house early was to make sure I would be among the first on my flight to seek a Business Select upgrade. My efforts proved successful – wildly so. For just $40, I moved up from C-41 to A-8 – a total of 153 spots. Pretty good bang for the buck, I say. I planned on doing the same in Phoenix and perhaps on my direct flight home Sunday morning, depending on what place in line I drew upon checking in. Regular readers of “The Travelin’ Man Chronicles” know my trips often feature one neat coincidence and it didn’t take long for this trek’s example to emerge. As I waited for the boarding process to begin, a woman sat down to my right. Me being me, I struck up a conversation and happened to mention I was traveling to Las Vegas to work a boxing match. That perked her interest. The reason: She said, many years earlier, she had looked after a pre-teen Ray “Boom Boom” Mancini when Mancini’s parents were away. Her story checked out because she mentioned other members of the family I’ve met, specifically Ray’s sister Ellen, who I first met 15 years earlier at a Boxing Ministries fundraiser in Youngstown. Not only that, the woman, whose name is also Ellen, told me she was a professional jazz singer who opened for Tony Bennett for three years. That story checked out as well as she showed me a photo of herself with Bennett as well as a snapshot of her in the 1970s posing in front of a marquee bearing her name. Thanks to the upgrade, I picked a window seat in row two because, had I chosen an aisle seat, I would have had to wait until my two seatmates arrived before settling in. The four-and-a-half-hour flight to Phoenix had its share of minor bumps, mostly because the ragged air caused the pilot to request at least eight altitude changes (all of which were granted). I’ve experienced worse but I’ve also experienced better. After deplaning in Phoenix, I noticed that an earlier flight had not yet left, so, in the spirit of Las Vegas, I gambled that a seat might be open on that flight and that I could arrive in “Sin City” even earlier. However when I approached the counter at C-13, I was told that not only was that flight full, it was overbooked and that a passenger or two would probably be shuttled over to my 2:05 p.m. flight. I knew why and Manny Pacquiao had a lot to do with it. I returned to Gate C-9 – a longer walk than one might think – and I sought a Business Select upgrade. I got one but barely; I secured the very last vacancy, moving me up from B-16 to A-15, a 31-seat move for $30. Upon entering the aircraft, I picked a window seat in row seven and was soon joined by a pair of older – but not elderly – ladies. The flight proceeded without incident and, because I was able to rest my eyes during both flights, I felt better than expected, given my topsy-turvy sleep schedule. The taxi ride from the airport to the MGM Grand took less than 10 minutes to complete but the check-in process took about 40 minutes. The reason: The hotel is in the process of installing an extremely large flat screen that promises to make the lobby even more spectacular than it already is but the electrical work required to do so shut down more than half of the usual work stations for the employees. Thus the line moved pretty slowly and the group of young Chicago men directly behind me in line made their displeasure known – loudly and repeatedly – and to no one in particular. After checking into my room on the 25th floor, I texted Sports Media’s Jeremy Thelen and Andy Vanderford that I was on my way to the truck to begin our electronic checks. Because the weigh-ins had just finished, the path to the arena was overflowing with foot traffic and I later learned I missed out on one of the day’s big stories. 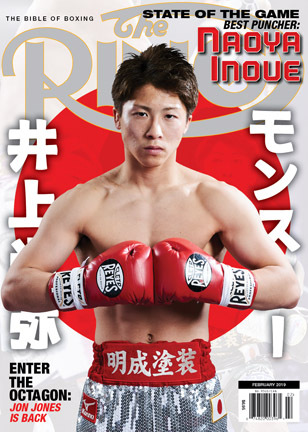 The first fight of the pay-per-view telecast pitted featherweight contender Jhack Tepora against former 122-pound titlist Hugo Ruiz but while Ruiz scaled 125, Tepora weighed 131 ½ – five-and-a-half pounds over the limit. The fight was eventually scrapped and a new opponent – two-time title challenger Alberto Guevara – was inserted. This development mandated that I produce a replacement statistical package but that would have to wait until I finished the electronic checks. Happily those checks were completed in less time than a prime Mike Tyson needed to destroy most of his opponents. With the format meeting an hour away, I had time to send out urgent emails to Fight Fax and do a little research on Guevara, in case I was asked about him. The format meeting ended about an hour after it started and, after purchasing a light evening snack, I returned to my room to work on the new package and, upon finishing it, email it to the appropriate parties. With that done, I wound down for the next little while and, shortly after 10 p.m. PST – 23 hours after I began this travel day – I turned out the lights. Saturday, January 19: Unlike most days, I fell asleep quickly and stayed that way for six solid hours. Following the morning routines, I wrote most of the words you’ve read so far, then went downstairs for two purposes – to check in for my Sunday morning flight and to find the meeting place suggested by punch-counting colleague Dennis Allen. The first part of the itinerary went well, though I drew a disappointing C-30 on my boarding pass. The second didn’t go as well: While I was able to quickly find the place where I thought we were to meet, getting back to my room proved an arduous process, thanks to the massive security protocols around the MGM Grand and the doors that only open from the inside. As a result, I had to walk around the entire periphery of the property to regain entry to the hotel. Because of that, I suggested to Dennis via text that we should meet at a more easily identifiable place – the boxing ring in the lobby. He, however, preferred that I meet him at the entrance to the MGM Grand Garden Arena, which I interpreted to be the outside entrance. To make a long story short, we eventually found each other; I gave him his credentials and we made our way to ringside. The electronic tests and confirmations took less than a round to complete and, just like that, we were ready to go. Except there were six-and-a-half hours before the start of the pay-per-view. The non-televised portion of the card also began with an explosion as cruiserweight Mitchell Spangler of Sacramento completed a successful pro debut over London’s Viddal Riley in just 33 seconds. A touch jab followed by a one-two to the jaw floored the 1-0 (with 1 knockout) Riley moments after the opening bell. After Riley arose, Spangler finished the job with a hook that scored the second knockdown and prompted the instant stoppage. After a pair of distance fights that saw welterweight Destyne Butler (5-0, with 3 KOs) outpoint David Payne (3-2-1, with 1 KO) over four and junior lightweight Desmond Jarmon (8-0, with 4 KOs) beat Canton Miller (3-2-1, with 1 KO) by six-round majority verdict, Dennis and I counted lightweight George Kambosos Jr.’s’ eight-round unanimous decision over Rey Perez to gather data for future reference. The match also carried some intrigue for me because Kambosos, who was 15-0 (with 9 KOs) coming in, garnered positive reviews as a prospect and because Perez (24-10, with 8 KOs) had scored back-to-back upsets against a pair of comebacking fighters in Roberto Marroquin (KO 8) and Christian Gonzalez (KO 7). Anyone hoping for a third straight upset for Perez were sorely disappointed as Kambosos’ blend of speed, mobility and boxing ability forced a long-range match that suited the Australian’s skill set. Perez tried to rattle Kambosos with his switch-hitting tactics but his anemic output (18.6 punches per round) doomed him to failure. Kambosos, who averaged 48.9 punches per round, landed 43% of his power punches to Perez’s 27% and out-landed him 89-32 overall, 23-13 jabs, 66-19 power and 28-4 in landed body shots on his way to a 80-72 shutout on all three cards. With a fairly low bar established, the final fight of the undercard between welterweights Jayar Inson of the Philippines and Dallas’ Jonathan Steele provided the most crowd-pleasing action. Steele scored the fight’s only knockdown in round one and the pair spent the remainder of the fight exchanging heavy blows that had the growing assemblage cheering. The decision was split and, thanks in part to the knockdown, Steele scored the minor upset and raised his record to 9-2-1 (6) while eroding Inson’s to 18-2 (12). The word around ringside was that we all were in for a very long night at the fights. Although my instinct prodded me to predict that the card would last the maximum 46 rounds, I guessed 44. Steve Farhood guessed 40; Dennis hopefully said 36 and ring announcer Jimmy Lennon Jr. posited 46. With so many rounds in store for us, we hoped that those rounds would, at least, contain attractive action or perhaps some good plot twists. What stories did this show tell? I’ll do my best to describe it them in Part Two. The post The Travelin’ Man goes to Manny Pacquiao vs. Adrien Broner: Part One appeared first on The Ring.